Just around the corner from the famous Blue Mansion and busy Penang Road is this new café and restaurant right at the start of Muntri Street. 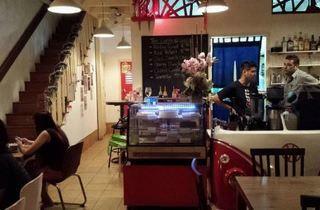 Housed in a little two-storey shophouse sandwiched by other similar buildings, the café is certainly cosy. Its increasing popularity, we suspect, is not only the friendly service, delicious food and cakes, but also the easy-going ambience it exudes. 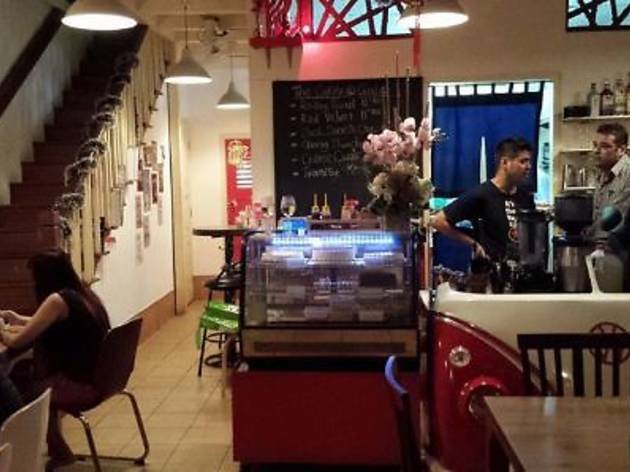 Trendy groups of Penangites flock here either during meal times for their innovative dishes such as rendang pasta or for a get together over dessert. We prefer to be here after sunset, when the café’s tables and chair spill onto the quietened street , lit only by street lights and the weather is cooler. Their imaginative western menu may be small but it doesn’t lack imagination – can you beat kimchi salmon spaghetti? Nevertheless, we stayed on the straight and narrow in terms of flavours and choose pesto linguine at RM16+, and decide to test the batter of their fish and chips at RM18.90+. Both turn out to be good choices. The pesto is fresh, tingles with the freshness of basil and it coats the al dente linguine very well. While the deep-fried batter of the fish is both crisp and of a nice thickness.